One of my favorite angels. Her story is not uncommon but must be shared. This is why breeding of these magnificent creatures should end. Please take a moment to read her story. She is one of the lucky ones that has found a loving forever home with my dear friend Janet. As with most rescues, her history is very sketchy, but we do know that for an extended period of time in her former life, she was banished to live in an outdoor shed. Besides a 2 cm hole in her chest, she was underweight, malnourished, and had an intestinal parasite (Giardia). 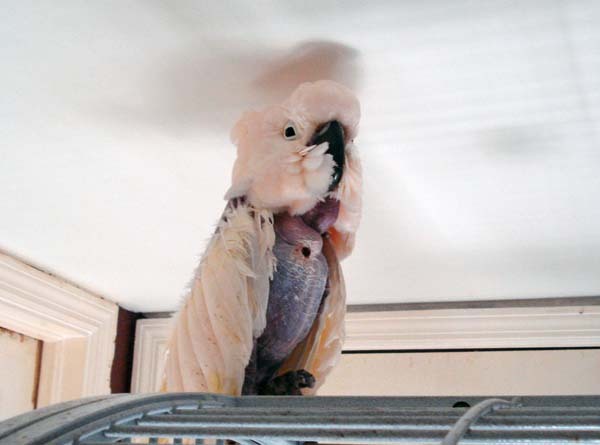 Noelle was bandaged to protect the wound in her chest and while both my vet and I hoped to see new feather growth, we both knew it was doubtful because it was evident that this little girl had been abusing herself for a very long time. A couple of follow-up visits later, our suspicions were confirmed. Except for some down feathers on her rump, there is not one hint of new feather growth. 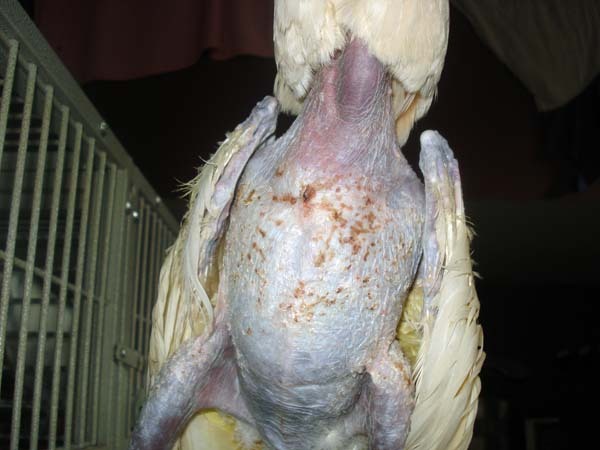 Because avian skin is so thin and because of her long history of abuse Noelle’s skin is very traumatized. The bandages allowed the hole in her chest to heal, but otherwise irritated her skin, and speckled her with body with tiny lesions. 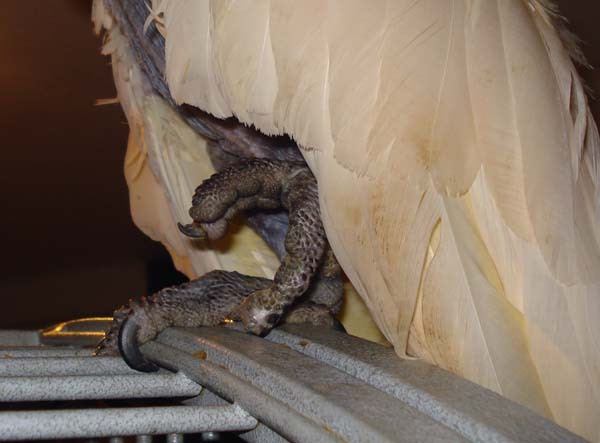 My avian vet believes that her life of abuse began as being captured in the wild, because the injuries to her toes are classic to those done by trappers. Trappers will maim a bird in this fashion, and then chain or glue them to a tree, so their cries attract other birds (for capture). We have a long road ahead of us, and I am sure that it will be met with both trials and tribulations. Whatever lies ahead, where she is going is better than where she’s been, and we will rejoice in the progress that she makes. The latest series of dresses has caused some improvement in her skin quality and the hole has closed, for now! 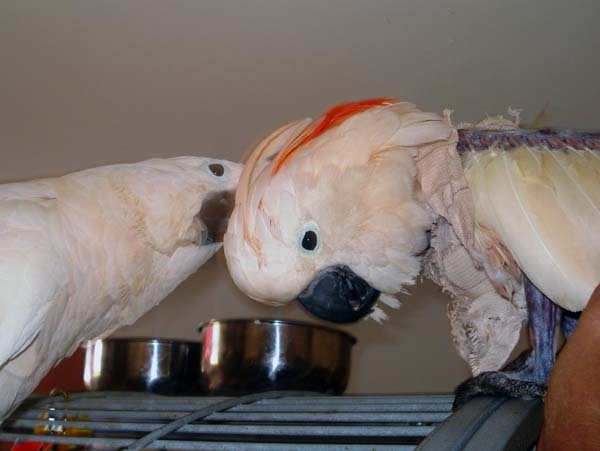 My other 5 cockatoos readily accepted Noelle into their flock and she instantly gravitated to my other female Moluccan, Echo. A friend of mine commented that she believes that the meeting between Noelle and Echo did more healing for Noelle than any human could in 50 years. I believe this to be true. As for Noelle’s personality, she is a gem. For all she has been through in her life, she is calm, trusting, forgiving, active, funny and an inspiration to me everyday! She gives me a great sense of joy everyday as she hoops and hollers with the other birds, plays with toys, eats new foods, closes those soft eyes of hers as she receives a full head pet and loads my cheek up with kisses, or gobbles down her before bedtime warm oatmeal (spoon food) which contains all of her “meds”. I enjoy making dresses for her and am constantly brainstorming ways to improve them. 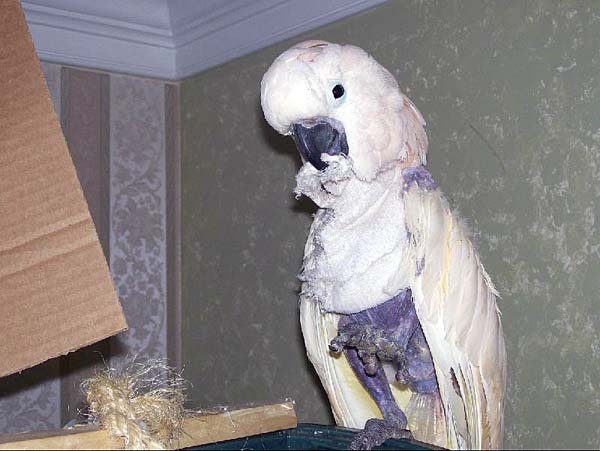 In addition to the daily joy she brings, she is also a painful reminder that this isn’t how she or any bird should be living their life. Noelle should not have been ripped from her homeland, maimed by trappers and endured a life in captivity, especially one of abuse, neglect and suffering. And Noelle is only one, of how many? I shudder to think. She is also a painful reminder of what captivity does to these birds, how cruel human-beings can be and why these birds need their God given right to remain in their native land, and live their lives as they were meant to, free with their own kind. Not pets in our home. Noelle is one of the fortunate ones that found a loving home, with all the medical care she so desperately needed. Along with love and companionship. There are thousands of these Angels, who are not so lucky. Many live out their lives in horrible conditions and do not ever know human kindness. These incredible creatures were never intended to be in our homes. They are loud, messy, and destructive. They were meant to be in the wilds where none of this would matter. Most cannot care for them properly without a great deal of education, and many considerations need to be made prior to bringing them into our homes. Too many times people purchase these amazing souls due to their beauty and all to quickly find out that their needs are far greater than expected. They are then tossed from home to home, which is increasingly detrimental to these precious souls. They are FLOCK creatures and are meant to stay with their flocks their entire lives. Rehoming them is so hard on them mentally. They NEED constant companionship, they are hardwired to depend on their flock at all times. As our companions, we become their flock and not many people are able to give them this type of attention. Without constant mental and physical stimulation, it can lead to plucking and mutilation …just like Noelle. The medical cost of caring for these Angels is very high. A healthy annual visit can be in the hundreds, illness can be in the thousands. There are literally thousands upon thousands of these beautiful Angels in rescues across the world. Please adopt and not purchase. Help be part of the solution that ends captive breeding. Look at Noelle’s sweet face and then decide! Deborah, thank you for sharing Noelle’s story. Noelle’s story is near and dear to me. Your journey with her also began my own personal journey to help educate and stop the abuse and neglect. So truly I owe you the thanks! Let me know if I can help.. I can make some collars for her.. would be happy to as soon as I can. She looks to be an umbrella. Patti parrotretweet@q.com What a dear face.. and so forgiving.. love the red turtle neck.. very cute. Hi Patti, it’s nice to *meet* you! (I’m Janet, Noelle’s mom). Such a generous and kind offer and we thank you very much! I am very happy to say that so far *touch wood* we have been successful in keeping Noelle from harming herself without collaring. I was hand-making her turtle neck sweaters, but for the couple of year or so, she has been wearing a Feather Protector for Severe Pluckers made by Avian Fashions, which is reinforced across the chest with Kevlar. Noelle is very comfortable and relaxed wearing them, as is her newest M2 sister (Charlee) who is also a self-mutilator. Thanks again! I love these creatures they’re gorgeous. I hope the poor darling enjoys her life, good on you for looking after her she looks very spoilt. I have a gorgeous cockatiel and he’s my baby/fid he is adored by my family and I love him to bits. He has what appears to be autism as he has repetitive habits, doesn’t like change in anything including routine, it usually takes at least 2 months for him to adjust to changes I make including changing and adding different toys to his cage he usually will not touch them or play with them for a minimum of 2 months and a lot of different changes makes him upset and angry, I LOVE him he is very special to me and is adored by my family too he has special nicknames from us and after dad is greeted outside as soon as he comes in the door he says hello to Gumnut and Gumnut talks to him too. He is an excellent guard bird and he has a beaut personality too:) My family think I’m the crazy bird lady apparently I am a bit over the top when talking about my boy, I’m very picky about his natural perches and toys and am very protective of him ( I check the weather reports on the news and sometimes my phone before putting him to bed and checking him regularly, if I have been away I will often sleep in the living room with him when I get back to let him know how much I love him).